We provide the best of American Made Flag Cases that are superiorly designed and handmade by veterans. So if you are seeking for the right custom made official flag case to celebrate someone or burial flag case for military funeral, then this is where you find it. A Flag case is a special package that you can offer a person who is still serving the country in the military. You can offer someone who may have recently graduated from officer training college, a boot camp or whom may have just enlisted in the armed services. Right here - we have the best of flag case to showcase the American flag and this is an exclusive gift, particularly since you can have the case distinctively engraved honoring your special loved one. This flag case is a perfect Gun Metal Military Finish and has a Glass Front, a removable back with Turn Button Closures. 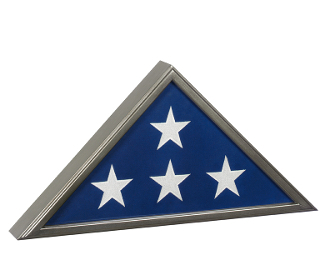 It is Wall Mountable and innovatively designed to accommodate standard internment burial flag 5'x9.5". The flag case is also affordably priced and comes with a quality that no other competitor can match. When you order today – it will be delivered within one business working day and very fast shipping. Our flag case come as silver flag display cases and is the best of American made flag cases. It is the ultimate gift to honor someone who is serving in the Army, Navy, Marines, or Air Force. The flag case collection is designed by same company responsible for designing the flag cases of President Kennedy and President Reagan. This is the perfect flag case to commemorate those in service to our dear country and is special for honoring our eminent military service members, heroes and other uniformed officers such as police and firefighters. It is the best case for memorializing your loved one who served in the Military. It is actually one of the most solid and beautiful case ever made and is the picture-perfect size case for presenting your flag and also offers sufficient expanse of space for your memorabilia. We have been providing special flag cases for many years till date and we are a leading provider online. And we have the highest quality products that are made in the USA, and at unbeatable prices! This flag case is a bestseller and if you or somebody you love has spent time serving your nation, then this is the precise flag case you should have. Get this flag case today shipped to you fast, because every trip back home is a victory and you should preserve the flags you bring home – stylishly and officially. The best way to honor those in the Armed forces is to offer them this flag case! The flag case is from the company that was honored to be selected to provide the flag case for President Ronald Regan’s burial flag. Orders for the silver Flag Case are usually shipped out within one business day to places within the USA and Canada.